This Flash tutorial will teach you how to create a cinema style text effect. This will give the effect of text getting smaller and fading downwards. This effect requires no action script. Select the text tool (t) and type your message on the stage. I used impact font type with red colour, but you can use whatever colour you wish. Convert your text into a symbol by selecting F8. Give your symbol an appropriate name, check movie clip and click ok.
You could alternatively use a knockout effect. On the timeline select the 40th frame and insert a key frame (F6). Now, move your text message towards the bottom of the stage using the selection tool. Now select the free transform tool (q) and hold shift key and drag one of the corners inwards until the text message is about 1/3 of the size. Change the colour properties of the movie clip to alpha at 0% and then right click anywhere in between the 1st and 40th frame and select Create motion tween. You should now have a cinema style text effect. Feel free to contact me for any questions or comments. Why can't I get it to work using Flash CS4 ? 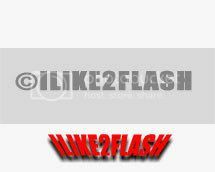 This tutorial works with all versions of Flash as you are only need to use the timeline and create a movie clip which is common in the versions of Flash. Please explain the problem you are having as it is difficult to tell what is going wrong? I don't know where the filters tab is. Where can I find it? I'm using Flash MX 2004 edition. Sorry i don't have Flash MX so I don't know the equivalent.